The idea of UserIdResolvers and Realms is described in section UserIdResolvers and Realms - The Concepts. You should read this to get an idea of how to setup LinOTP in the right way. Which can be used to read users from LDAP servers like OpenLDAP, Active Directory and Novell eDirectory. Which can be used to read users from a vast number of different SQL servers. Which can be used to read the users from any flat file located on the LinOTP server. This would usually be a copy of /etc/passwd or any other file in compatible format. The LDAPIdResolver can be used to resolve user login names via OpenLDAP, Active Directory or Novell eDirectory. contains the name of the UserIdResolver, it may contain characters, numbers and ‘_-‘. addresses of the LDAP or LDAPS servers. Starting with 2.9.1 LinOTP will try to establish a secure connection to the LDAP server via StartTLS. This will work even if LinOTP can not validate the servers certificate unless the “Enforce STARTTLS” option is activated as described below. If LinOTP fails to contact the first LDAP server, it will try to contact the second one. If the second one can be contacted, it will be set first then. Thus LinOTP will ensure a secure connection to a trusted LDAP server. Alternatively certificates can be stored directly in the operating system. the tree which contains the required data. the distinguished name used to connect to the LDAP server. This should be an extra account created for LinOTP without any further permissions. password of the query account. contains one or two values (in seconds) of the format 5.0;7.5 The first value is the timeout to connect and log in to the LDAP server. The second value (optional, available in LinOTP >=2.8.1.2) is the time to wait for an answer from the LDAP server after the session is established before terminating the connection. how many user entries are requested from the LDAP. when configuring a LDAPIdResolver for connecting to Active Directory and your BaseDN is set to your top level domain components like dc=mydomain,dc=com you should also select this option. 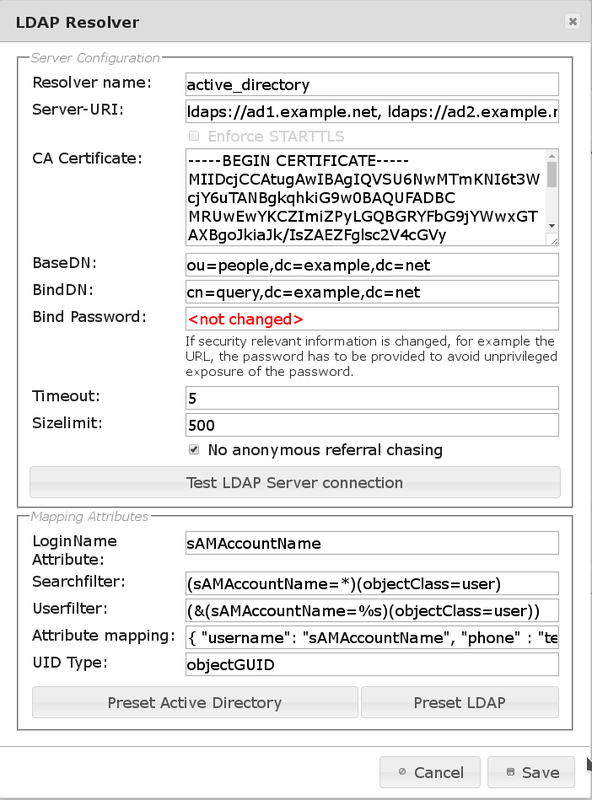 Before saving your configuration, you should push the button “Test LDAP connection” to see, if your settings enable the LinOTP server to connect to the LDAP successfully and if any users can be found. If you have got problems setting up your LDAP connection, you may monitor your LinOTP log file /var/log/linotp/linotp.log on your LinOTP server. This may give you some clues about problems with the LDAP connection. Also see section LDAP/Active Directory Connection. is the attribute that holds the name the users will use to login. is used to filter the user objects found within the configured base DN . You can only assign tokens to those users found by the search filter. in turn will be used to resolve the users the other way round. E.g. if the user logs in, he will provide the loginname. The login name will be replaced with the “%s” in the user filter, to resolve the login name to the distinguished name of the user object in the LDAP. will fetch more user information from your LDAP server and map them to correct internal identifiers of LinOTP. So for example the LinOTP attribute phone can be used for SMS token and here you tell which LDAP attribute should be mapped for this purpose. The required attribute is username. All other attributes are optional. this identifies the user entry unambiguously. So for example if the user name is changed the user can login with the new name and his previously assigned tokens. This attribute should be objectGUID for Active Directories and entryUUID for OpenLDAP. By default “Preset Active Directory” is selected to configure the default LDAP attribute definitions do fit the needs in an Active Directory environment. In this case you will not need to change the attribute definition manually. Select “Preset LDAP” for a setup with OpenLDAP. After having entered and checked all necessary values, you need to push “Save” to store the changes. contains the name of the driver as used in sqlalchemy. mysql is configured and supported by default for other SQL engines (like Oracle) dependencies have to be installed and configured in the operating system. the port to connect to for accessing the database. the account used to connect to the SQL server. This should be an extra account created for LinOTP without any further permissions. the name of the table where the users are stored in. how many user entries are fetch with one request from the SQL server. the encoding of the database. This should be “utf-8” but could also be something like “latin1”. these parameters are added to the connection string. The parameters very much depend on the used driver. If you are only using ASCII characters you will not have to bother with this setting. E.g. for a mysql database containing utf-8 tables and storing usernames with non-ASCII characters, you should add the parameters “use_unicode=1&charset=utf8”. Before saving your configuration, you should push the button “Test SQL connection” to see, if your settings enable the LinOTP server to connect to the SQL server successfully and if any users can be found. and map them to correct internal identifiers of LinOTP. 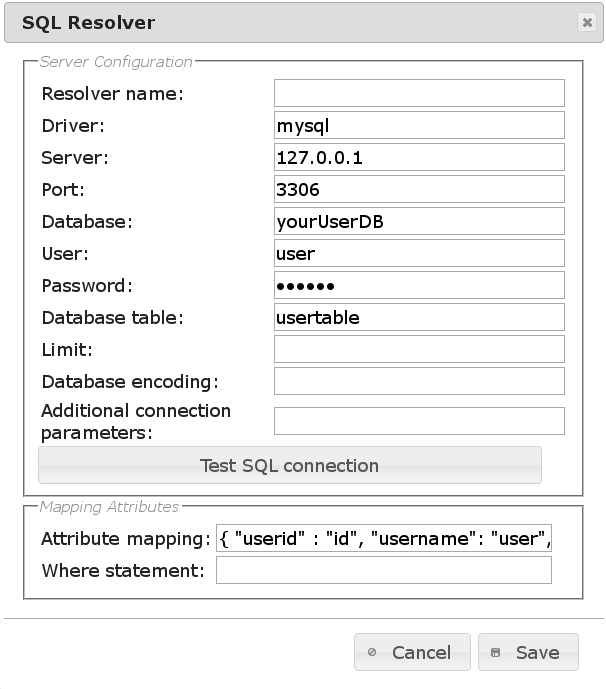 So for example the LinOTP attribute phone can be used for SMS token and here you tell which SQL attribute should be mapped for this purpose. The attributes username and userid are required. All other attributes are optional. The password column in the attribute mapping holds a encrypted password, where the first two bytes are the salt that was used to crypt the password. The tool create-sqlidresolver-user.py can be used to create encrypted passwords. can be used to filter the users used for LinOTP. If you e.g. only want to use with an ID bigger than 5 you could enter a where statement like “id>5”. If your usernames or other fields contain non-ASCII characters you probably use another encoding. In this case you can enter the information, what encoding your database table uses. Usually it might be latin1 or utf-8. After having entered all necessary values, you need to push the button “Save” to store the changes. The simplest user store are flat files on the LinOTP server. These flat files can be used by configuring the Flatfile UserIdResolver. You only need to enter the filename of the file on the LinOTP server. The default filename is “/etc/passwd”. Please be aware: If you wish to use system user password hashes (as OTP PIN or logging in to the selfservice potal), the file must contain the actual password hashes. You can use pwunconv to transfer the hashes from “/etc/shadow” to “/etc/passwd” . “/etc/passwd” can then be used as the target for the UserIdResolver. Or alternatively, a new independent file can be created as a copy and used as target as described below. After this the procedure can be reverted with pwconv . We recommend the use of a separate file. If you decide to operate on the passwd file of your system please take note: when hashes are moved from “/etc/shadow” to “/etc/passwd” , your system will no longer apply any configuration regarding password aging. Also, you should consider changing the permissions of “/etc/passwd” in order to prevent access by locally logged in users. Please check the configuration carefully because the security of your systems depends on it. column: description. Containing information about given name, surname, email and phone numbers. According to  this field is a comma separated list of 5 items. item: Name. The name is split by a blank into given name and surname. item: Used as mobile number. item: Used as phone number. item: Used as email address. LinOTP does provide a tool for creating syntactical correct entries: linotp-create-pwidresolver-user . In the Appliance you have to enter unsupported mode first in order to be able to execute the programm. The file /etc/passwd does not contain the password. Using the tool linotp-create-pwidresolver-user you can create valid lines, that also contain the password.